Size: 396 x 495 mm. Published in the famous historical Atlas "Parergon" by Abraham Ortelius. A very detailed map of ancient France. This map is based on ancient geographical sources that include Strabo, Plinius, Virgilius and Caesar. 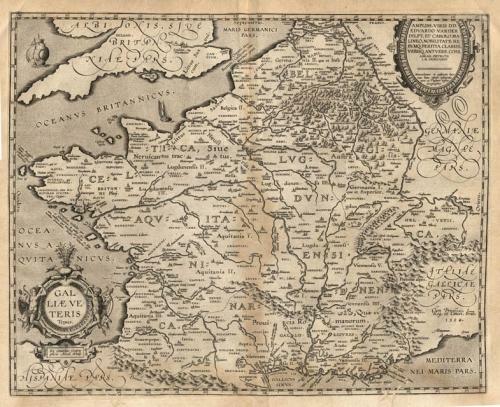 The condition is good for such an old map with some browning at the center fold and across the bottom margin into the image area. There are two tears / worm holes that have been taped at the verso that intrude slightly across the base line.